Last week, it was revealed that Dexter Filkins is leaving the New York Times for the New Yorker. Obviously, its a massive loss for the New York times. But for the readers? This means that Mr. Filkins will have more time and room to produce the kind of profound stories that he has done more often than any reporter of our time. And at that moment, you think about how the word of his death will travel; how it will depart Iraq or Afghanistan and move across the ocean and into the United States and into the town where he lives, Corinth, Miss., say, or Benwood, W.Va., and into the houses and the hearts of the people who love him most in the world. And at that moment, standing there, looking down on the dead man, you can wonder only what the family will do when the terrible news finally arrives, how they will resist it and wrestle with it and suffer from it, and how they will cope and how they will remember. 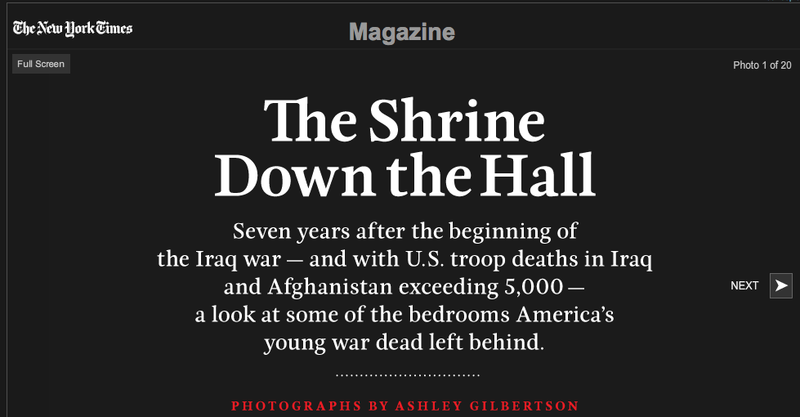 This entry was posted on Monday, December 13th, 2010 at 4:30 am	and tagged with Dexter Filkins, Soldiers in War, The Forever War, The New york Times, The New Yorker, War reporting and posted in Media. You can follow any responses to this entry through the RSS 2.0 feed.